Patricia Smith Wood’s father, a career FBI agent, sparked her interest in law, crime solving and mystery. After retiring from a business career that included working at the FBI, being a security officer, and owning her own computer company, she published her first mystery, The Easter Egg Murder, a 2013 NM/AZ Book Awards Finalist in the Mystery Category. 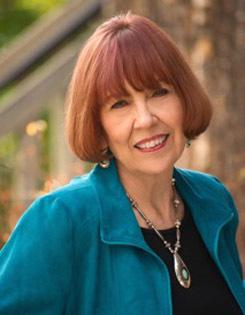 Her second book in the series, Murder on Sagebrush Lane, was published in March 2015. The third, Murder on Frequency, was released in 2017. There’s nothing unusual about a ham operator contacting other radio enthusiasts. Unless he’s been dead for five years. When Harrie McKinsey and Ginger Vaughn—who have been described as the Lucy Ricardo and Ethyl Mertz of murder mystery—decide to study for their ham radio licenses, they get pulled into this mystery and find a trail leading to a long-lost treasure somewhere in New Mexico. Before it’s over, there’s another murder, an abduction, and a showdown with an aging Mafia don who values treasure more than human life. Harrie, Ginger, and their merry band of FBI, APD, and private detectives have to be on their toes to prevent another murder and save a family. Instead of her newspaper, Harrie McKinsey Scott discovers a small child sitting in the flower bed, her pajamas smeared with blood. Harrie’s search for the child’s parents involves her in a grisly murder investigation, a second murder, an attempted kidnapping, stolen top-secret data, and a killer who intends to make her his final victim. Harrie McKinsey and her best friend and business partner Ginger Vaughn discover that some secrets are best left buried when retired Senator Philip Lawrence hires their editing firm to assist him with a book about the famous unsolved 1950 murder of a cocktail waitress that led to the end of illegal casinos in New Mexico. When the Albuquerque newspaper announces that Senator Lawrence is writing the book, one person with a connection to the case is murdered and another narrowly escapes death. Despite the best efforts of Ginger’s husband and an FBI agent Harrie finds infuriatingly attractive, the energetic pair cannot resist trying to discover who is so anxious to destroy the book, the senator, and his big secret. But will their proficiency and pluck be up to the challenge when they land in a dark house with a cold, calculating killer who has nothing else to lose? Hi! I was wondering when Murder on Frequency is due out. I’m anxiously waiting!! Thanks, Elizabeth, for your wonderful question! I hope it will be available by October 1, 2016. I’m working diligently to make that happen. If all goes well, and we don’t run into any glitches, that’s the date. Check out my website: http://www.patriciasmithwood.com, for further updates and information. Again, thanks for being a fan. I do love fans, especially ones who are eager for the next book!